He felt neglected by his wife who was absorbed in their children. So he sought the love of another woman, but was it enough? Kinnars were mythical creatures, and they said that all they could offer was a life like theirs. Lapita wondered, what kind of a life would that be? “A life of love and that of a lover and none other. There was no place for a third in their love, not even offspring’s, but a life of everlasting love,” said the Kinnars. Lapita wondered if that was life at all, and the Kinnars assured her that it sure was life. Lapita opted for a life of everlasting love and since then was waiting for her lover in this bower of hers. One spring morning, she found a handsome rishi, the most handsome rishi she had ever seen, standing in front of her bower. He was Mandapal, who had once embraced the life of celibacy to seek knowledge. His father had suggested that he get married and live the life of a householder, to ensure the salvation of him and his ancestors. While he had not quite heeded his father’s wishes and that of the society, he was also told that there was a girl Jarita, who was waiting for him and would marry none but him. The thought of a person waiting for someone, giving up on normal life, intrigued the seeker of knowledge. Thus he decided to seek her out and so he was on his way to the Khandavprastha, the forest where Jarita dwelled. Lapita wondered what made Mandapal seek Jarita suddenly. Mandapal replied that he had realised that there was no life without a wife and offspring and that he had to attain completion. Lapita laughed. What kind of a life would that be when more than two is a crowd? She espoused the life of love which had space for none between two lovers. 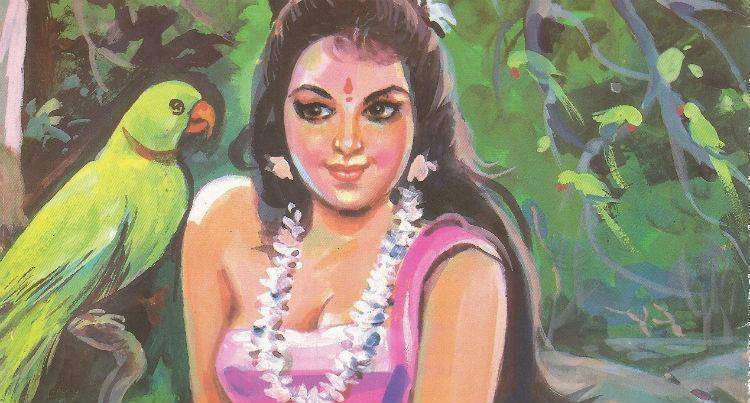 Mandapal was unsure if that was life and wondered who she was. Lapita assured him that she too was a mortal and knew that such life did exist and was more enjoyable than what Mandapal was seeking. Mandapal couldn’t help but exclaim that while Lapita sure was beautiful, the same couldn’t be said of her thoughts. “I have never come across a plant which didn’t like flowers,” and with these words Mandapal left the bower. But Lapita’s eyes had found whom she was seeking and knew that this was her love. She called Mandapal and said that he could go seek a life that he wanted, but she had found hers. She would love none but him and wait for him. From, then onwards, her eyes would seek and wait for none but Mandapal. Mandapal saw her pained and sad face and moved on. Jarita was ecstatic to see Mandapal. Her happiness knew no bounds when she saw him. The two got married and time flew fast. The marriage yielded children and soon Jarita got busy with life, family and children. Mandapal was beginning to feel a void in his life, as he found Jarita always busy with their four children. Mandapal’s love was seeking a partner and he never found Jarita with him, even when the two were alone, as she was always preoccupied by the thoughts of her children and their needs and wants. Mandapal’s heart felt lonely. Jarita realised it and assured him that on the full moon night, she would meet him as before. That night Mandapal met Jarita with a garland of the choicest fragrant flowers. But just when he was about to garland her, Jarita rushed to attend to one of their children, who she thought had called for her. Mandapal’s unfulfilled love burnt him inside and he left home. He soon found himself at the bower of Lapita who was waiting for Mandapal ever since he had left. Lapita welcomed him. Mandapal garlanded Lapita and lived a life of love and joy. One day, Mandapal noticed Lord Hutashan, the god of fire, heading towards Khandavprastha in what seemed to be a bid to consume the forest. This disturbed Mandapal, as his cottage was in the same forest. Lapita noticed his disturbed face and asked him the cause of his concern. When Mandapal told her that he was worried about the safety of his children, Lapita was saddened to see that Mandapal’s heart still ached for someone other than her. When Mandapal decided to pray to Lord Hutashan, she got angry, but agreed to join Mandapal in his entreaties to the lord of fire. Mandapal drew Jarita closer to him, but just then Lapita sprang in front of them from nowhere. She had the same garland which Mandapal had given to her when he had come to her bower. Her eyes gleaming had Mandapal worried. At last she said, “Don’t worry Mandapal, I will do nothing to you as I accept defeat. Defeat not from you or from your wife, who sure is more beautiful than me. But defeat from those who have made your wife more beautiful than me. The precious gems which adorn her, your children.” Mandapal pleaded to Lapita not to curse his children, as they were most precious to him than any wealth of the world and so was Jarita who had endowed him with such wealth. Lapita stared at Mandapal’s sad and helpless face. 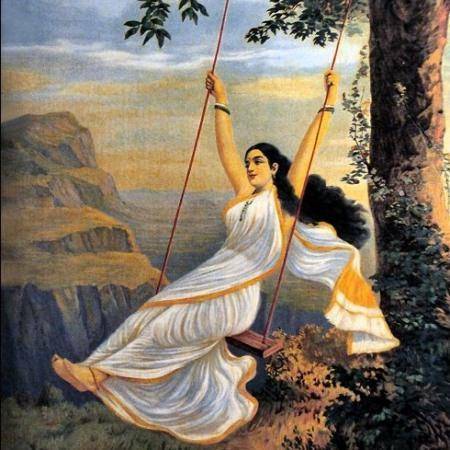 She held the torn garland in her hand, and with sadness on her face, said, “No, rishi Mandapal. This garland that you had given me, will now adorn your precious gems. I have not come to curse, but to see, what I have lost. They, who have defeated me, will adorn this garland.” So saying, Lapita garlanded the children and left. She left for her bower, Lapita still alone, but waiting for none. This is an abridged version of the English translation by Pradip Bhattacharya, of the Bengali story written by Subodh Ghosh. This is a dense story with many complex underlinings. But here’s something that touched me the most. The ending of the story. “Lapita still alone, but waiting for none” . It takes courage to acknowledge the loopholes in our choices and harder still to make peace with it. And she did both. And that, for me, is really empowering. Mahabharat is full of such beautiful stories, but we are so busy following the same main tale, that we miss out on some of the gems scattered across the entire epic. I absolutely agree with you, Sir. Such a dense Tale has so much potential to multiply itself. Because, every character can be expanded. There’s a beautiful term I have come across. “Sonder” – the realization that each random passerby is living a life as vivid and complex as your own. That term had such a deep impact on my thought process. And we can apply the term in this context also. And, what a satisfying feeling it is to realise that there’s always more to receive from this ocean of wisdom our myth has gifted us. I would be waiting for more such enlightening articles from you.